And then every year I try to remember why I pick the flavor of the month as my free drink because I can barely finish it. 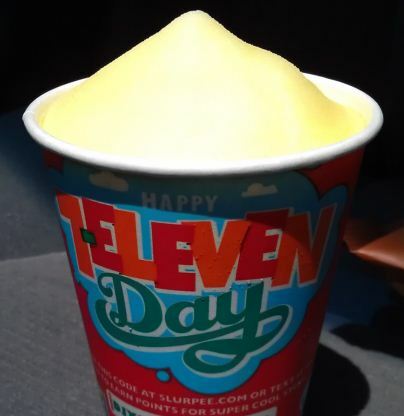 This month's slurpee flavor is Fanta Lemon Crème and like most slurpee flavors, it's disgusting despite being billed as the perfect combination of sweet and tart. It amazes me that they come out with all these flavors yet they always seem to taste so similar. I thought by some fluke I might get a funky lemonade vibe, but no, it's much more of a twisted orange cream flavor with just less orange and more... iunno, I don't taste lemon at all so I don't know what they mixed with it. It doesn't even smell like lemons. To be honest, I don't know if I should drink it or wash my hands with it because it smells like soap. Despite this terrible slurpee (which I did manage to finish), I still wish 7/11 a happy 85th birthday. at least it was free! You really can't go wrong with a Coca-Cola Slurpee. It is one of the greatest things ever made. T.G.I.W.F. - look, I made a new acronym!